Mordecai Richler left Montreal to live in London in 1954, shortly after the publication of his first novel. He remained there for most of the next 18 years. In London, he married, divorced, married a second time (this time for good), and fathered five children. He also wrote six novels, including three of his best (The Apprenticeship of Duddy Kravitz, Cocksure, and St. Urbain's Horseman), plus a handful of screenplays and numerous essays for major publications on both sides of the Atlantic. So why'd he come back? He answers that question in "Home is Where You Hang Yourself," the lead essay in his book Home Sweet Home. Nostalgia played a big part: "A longing, striking me at 3 a.m., to see big Jean Beliveau carry the puck all the way down the Montreal Forum ice one more time. Or the need, overtaking me with equal suddenness, for a smoked-meat sandwich from Schwartz's incomparable delicatessan on the Main." His primary reason for returning, however, was artistic: "What really impelled me, after years of vacillating, to finally pack my bags was a recurring fear of running dry, a punishment, perhaps, for luxuriating all those years in London, not paying my Canadian dues. Literary London had been uncommonly hospitable. It was still exhilirating. But, looking around — counting heads — survivors — it suddenly seemed to me that too many other expatriate Commonwealth writers, writers I respected, had been driven in exile to forging fictions set in the distant past, the usually dreaded future, or, indeed, nowhere. Which was sufficient to frighten me into trying home again, going back to Montreal." Author Mordecai Richler fixes his absurdist’s squint on a moveable feast of a city, Montreal. The incomparable Ritz. Where once impeccably schooled brokers could conspire over malt whiskies and dishes of smoked almonds to send a dubious mining stock soaring. Where, after a morning of trying on dresses in neighboring Holt Renfrew, matrons of good family could meet for a lunch of cold Gaspé salmon and tossed salad in the garden café. ... The Ritz had fallen on such hard times that it now admitted visiting hockey players to its gilt bedrooms — even the players from expansion teams. The Café de Paris, the Maritime Bar, would never be the same. Mordecai Richler may or may not share that opinion with Joshua Shapiro, protagonist of Richler’s 1980 novel Joshua Then and Now. But Montreal’s best-known writer — novelist, essayist, screenwriter, GQ books columnist, anthology editor (The Best of Modern Humor) — has chosen the Café de Paris, the chic upstairs piano bar at the Ritz Carlton Hotel, for today’s rendezvous. Richler, 59, whose ninth novel, Solomon Gursky Was Here, is being released in the United States this spring (it was rushed into print early in Canada, in time for 1989 Christmas shopping), has agreed to take me on a tour of the city he has written so much about. Richler spent nearly 20 years living the expatriate’s life in London, returning to Montreal in 1972. Yet even while based overseas, Richler was writing about his hometown as he remembered it — in his novels Son of a Smaller Hero, The Apprenticeship of Duddy Kravitz and St. Urbain’s Horseman, and in his short-story collection, The Street. Since returning to Canada, he has continued mining the Montreal ghetto, circa 1940. But in Joshua, Gursky and his 1984 essay collection Home Sweet Home, we also get large doses of Richler’s take on contemporary upper- and middle-class Montreal. Today he’ll be showing me a little of both, Montreal Then and Now. 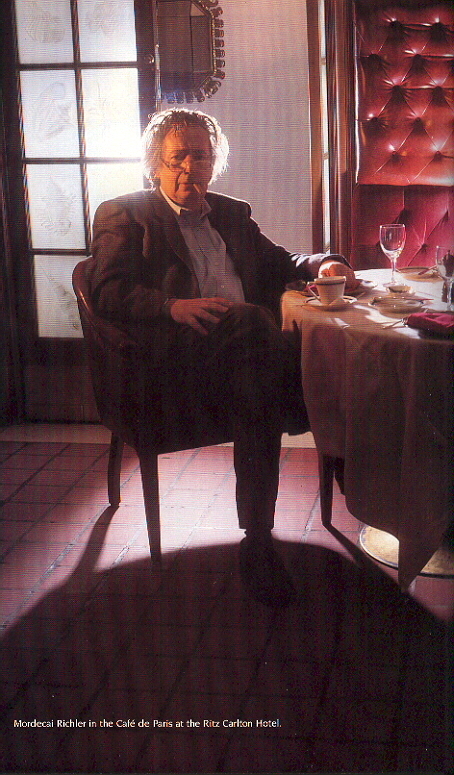 Dressed in blue tweed jacket, striped shirt, dark tie and light-brown corduroys, Richler has made himself conspicuous by choosing the banquette just inside the Café de Paris door. I’d have recognized him without the help: his clothes a little too tweedy and rumpled, his gray-streaked hair a little too long and unruly for him to pass for a Café de Paris stockbroker. It’s Friday, half past noon, and Richler is halfway through his first scotch of the day. He orders me a drink, nursing his first one while we chat a bit. Then we fetch our coats and his galoshes and head off toward lunch. He may look too literary to belong to this neighborhood and its furriers, jewelers and other pricey shops, but as we walk up rue Sherbrooke and turn left on Crescent, Richler explains that he and his wife have held on to their apartment catty-cornered from the Ritz even though in recent years they’ve been spending most of their time in their home in the country. It’s a great location, within a few short blocks of some of the city’s most popular nightspots and restaurants ... and some of Richler’s favorite watering holes, one of which he suggests we stop off at for a quick one when we’re through with lunch. Like many writers, Richler is quiet in person, almost shy, as if he saves all his hell-raising and showing off for the printed page. He responds to questions politely, but rarely at much length, and asks nearly as many as he answers. When I ask whether he is often recognized around the city, he replies, “Sometimes,” then quickly changes the subject, recalling with a laugh how perplexed Montrealers were in 1973 when they learned that a feature film was being made from The Apprenticeship of Duddy Kravitz. As we’re walking to lunch, I get my first look at a distinctive Richler mannerism, what I come to think of as his absurdist’s squint. We’re talking about the separatist movement in Quebec. Richler dislikes it. “It’s breaking up families,” he says, by causing career-minded children of Anglophones to relocate to English-speaking cities such as Toronto and Vancouver. Moreover, he says, sometimes Québecois pride is carried to ridiculous extremes. Storefront signs are illegal if they’re not in French; inside the stores, English-language signs are allowed, so long as they’re smaller than the French signs accompanying them. “They actually come and measure,” Richler says, stretching his arms apart as if holding a tape measure. “It’s stupid.” Then he does it: squints, curls his lip into a wry grin, shakes his head and shoots me a quick, conspiratorial glance — a silent comment on another of life’s absurdities. Richler’s eye for absurdity isn’t surprising: in fact, it’s central to his writing. He deals seriously with themes such as family (his own marriage has lasted 30 years and produced five grown children), politics, class and ethnic differences. But Richler is also a scathingly funny writer, one with scant patience for foolishness, including his own. He’s part satirist, part social realist — something like Tom Wolfe in The Bonfire of the Vanities, only with darker, quirkier humor and less-cartoonlike principal characters. We lunch a le Mas des Oliviers, on rue Bishop, a couple of doors down from Woody’s Pub, the bar we’ll stop off at for a post-lunch cognac. Over a lunch of steak with mushroom sauce and a big plate of pommes frites, Richler sticks mainly to two themes: literature and sports. His old friend Terry Southern, co-author of Candy and the scripts for the classic ’60s films Dr. Strangelove and Easy Rider, has been living reclusively in rural Connecticut, regrettably unproductive in recent years, though Richler says he has heard secondhand of an excellent but as-yet-unproduced Southern script about the Watergate break-in. After lunch, Richler drops by Woody’s to say hello to Richard Holden, a local representative to Quebec’s provincial assembly. Holden wraps up the meeting he’s having at a nearby table and joins us at one end of the bar. Richler teases Holden, saying he will attend a dinner party that night for Don Johnson, a former cabinet member whom Holden doesn’t care for. The barmaid brings by a couple of copies of Solomon Gursky Was Here that patrons have left behind the bar for Richler to autograph, and the author, after putting on his glasses and reaching into his cigarette case for one for his trademark Schimmelpenninck cigarillos, dutifully signs the books and hands them back for safekeeping. Then Richler tells Holden he may be back later, and we go outside and catch a cab. Soon the Montreal of Richler’s youth is flashing by our cab window, Richler issuing directions to the driver in French. Fletcher’s Field, the big grassy lot where he and his friends played baseball. Baron Byng High School, his alma mater (now closed), called Fletcher’s Field High School in Richler’s fiction. The shops along Park Avenue, the street where he got his first grown-up haircut (no more board across the barber’s chair arms) and later worked setting up pins in a bowling alley. Pointing up an alley, Richler notes he isn’t the most famous writer to have come from the neighborhood. “Saul Bellow was brought up here,” he says. “In Herzog, there’s a long chapter about this area. He was born in Lachine, which is a suburb, and was brought up here. Then his family moved to Chicago when he was about 10 or 12.” Richler, too, very nearly wound up in Chicago. His grandfather came to the New World from Galicia with a train ticket to Chicago in his pocket. On the boat to New York, he met a man who had a ticket to Montreal but relatives in Chicago. Richler’s grandfather knew somebody’s cousin in Toronto, so they swapped tickets. Our tour of the old neighborhood includes two important stops. First, the Bagel Factory on St. Viateur, now known officially as La Maison du Bagel, Boulangerie. The Bagel Factory is a mandatory stop for anyone revisiting the old neighborhood. It’s the place where the Fletcher’s Field High cadets picked up the stack of bagels they passed among themselves while marching through the opening credits of The Apprenticeship of Duddy Kravitz. 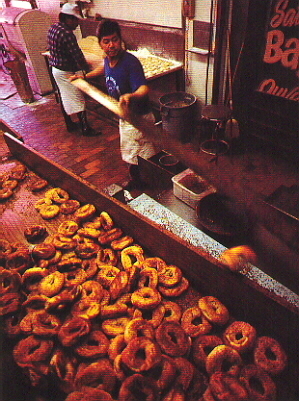 Hundreds of hot bagels fill a metal cooling chute and a big storage bin in front of it. Dozens more, spaced evenly along long wooden paddles, are cooking in the open over. Richler buys a couple of dozen and offers me one, which I munch in the cab. These are Romanian bagels, less doughy than those you get in the States and, to Richler’s thinking, a good deal tastier. The second stop is his boyhood home, a three-story red and gray row house at 5257 St. Urbain. “Look at that,” he says, noticing the sign out front. “It’s for sale.” He talks about the winding metal staircase leading up to his family’s second-floor flat, such “hell to keep shoveled” in winter. He smiles and recalls that when he used to get home from school and find the door locked, his mother off on some errand, he’d scale the balcony adjacent to the staircase, entering the apartment through the unlocked window. Aside from the television aerials, Richler says, the street looks much as it did when he was growing up here. Its ethnic makeup, however, has changed, the working-class Jewish population replaced in large part by a new wave of immigrants, mostly Greek, Italian, and Portuguese. Also yuppies, who’ve been gentrifying the neighborhood, bringing with them their chic boutiques and espresso cafés. 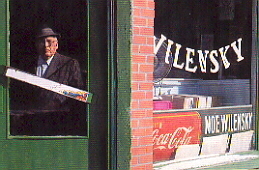 We also stop briefly across the street from Wilensky’s, a corner snack shop from Richler’s childhood. “We filmed part of Duddy Kravitz in here,” he tells me. “Do you want to go in?” Richler looks like he’d rather we didn’t, so I decide I’ll come back tomorrow instead. Richler stops to buy some flowers for his wife, after which we head back in the cab toward Woody’s. On the way, talk turns to Richler’s early days as a writer — the fond memories of which make him as close to expansive as the taciturn writer will get all weekend. He departed from Montreal in 1951, not yet quite 20 years old. “In those days, you could live in Paris for $80, $90 a month,” Richler recalls. “There were a lot of writers there and little magazines.” Richler hooked up with a group of young writers connected with New-Story magazine, among them Terry Southern, Mason Hoffenberg, Herbert Gold, and Alexander Trocchi. “What we used to do —,” Richler says, laughing, “ — UNESCO was there, and we’d all sit around trying to come up with stories based on famous anniversaries. If you could figure out that 100 years ago Mozart died, whatever, you could sell a 500-word piece about it to UNESCO for $35. And whoever got the idea first owned it.” He laughs again. “And we’d rack our brains: ‘Tolstoy went to the railway station? No. Gettysburg? No.’ Any anniversary. And 35 bucks — you could live for two weeks on that. Glancing out the cab’s window as we re-enter the shopping and nightclub district that lines rue Ste. Catherine, Richler reminisces about what compelled a 19-year-old Montreal street kid to gamble on launching a writing career across the ocean in Paris. The cab pulls up in front of Woody’s. Back inside, Richler sheds his coat and offers hot bagels to friends at the bar. Several more regulars show up, and Richler buys a round. Roy, who’s in the process of peddling a just-finished children’s book, tells Richler about a trout-fishing camp he has heard about. (Richler shares with Moses Berger, the main character in his new novel, a fondness for fly-fishing — and single-malt scotch and fine cognac.) Nick, a city councilman, chomps on a bagel and tells funny stories. A third man, as he orders a scotch, wonders with Richler why many younger whiskey drinkers, including one of Richler’s sons, prefer bourbon. An hour passes like this, in pleasant, lazy, happy-hour conversation. Then Richler grabs his wife’s flowers and what’s left of his bagels and head home to get ready for tonight’s dinner party. Before meeting him Saturday afternoon at his house in the country, I check out one of Richler’s favorite lunch haunts: Schwartz’s on Main (known more formally as Charcuterie Hebraïque de Montréal, or Montreal Hebrew Delicatessen), located near his old neighborhood. Richler recommends the smoked-meat sandwich, smoked meat being a Romanian lunch meat that’s somewhere between corned beef and pastrami. Richler loves the stuff. In the second of his two children’s books, Jacob Two-Two and the Dinosaur, Jacob Two-Two’s father is given the dreaded and infamous Smoked Meat Torture by an army intelligence officer who wants to know where Jacob and the dinosaur have run off to. This involves being strapped into a kitchen chair and made to watch a roomful of people devour a steaming platterful of smoked meat — “its aroma maddening to men, women, and children everywhere” — and other Schwartz’s-style goodies. Schwartz’s is packed, and it’s barely past 11 a.m. I squeeze onto an empty counter stool and order a smoked meat and a coffee from one of the half-dozen scurrying countermen. The sandwich is simple — slabs of hot meat piled thick between slices of fresh rye bread, with a dollop of mustard. It’s also spectacular. I like it so much I order a second, passing on what look like excellent French fries on the theory that I could always get them back in the States (a bad miscalculation: I’ve since read in Birnbaum’s Canada 1990 that Schwartz’s fries “may be the best on this continent”). I walk off my lunch by making a pass down boulevard Saint-Laurent, or what the locals call the Main. There’s a pleasant Old-World feel to the area as the Saturday-afternoon shoppers bustle among the butcher shops and shoe stores that line the boulevard. The squat little buildings and their French façades make the district seem warmer somehow than the shopping districts you’ll find in, say, Dallas, or for that matter, Chicago. 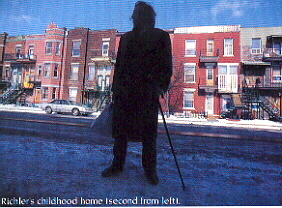 Next I drive up St. Laurent maybe a dozen blocks, turn left on St. Viateur, hang another left on St. Urbain, and pull up again in front of Richler’s boyhood home. I get out for another look at it, then cross the street for a better look at the buildings across the street from it. Richler’s grandfather lived in one of them in the early ’40s, and Richler tells us in one essay (“My Father’s Life,” originally written for Esquire) of when he and an uncle, who was only three years older than Mordecai, got so involved playing with a chemistry set in the grandfather’s basement that they missed that evening’s shul. His grandfather returned, furious, and smashed all the boys’ test tubes. Today, standing before what was once his doorstep, I wonder what the old man would make of the changes here: The buildings across from 5257 St. Urbain now house, side by side, Hindu and Buddhist meeting places. I dwell in front of Wilensky’s for several minutes, long enough that I’m eventually joined by a bearded man who asks — first in French, then in English — whether he can help me. It turns out that this is Saul Wilensky, nephew of Moe Wilensky and grandson of the original Mr. Wilensky. This Mr. Wilensky is pleased to hear that “Mr. Richler” brought me past the place. He doesn’t have a key, so he joins me at the window, pointing out some news clippings about the filming of the movie that are posted on the far wall, behind the bookshelves. He also tells me that this isn’t the original Wilensky’s location — he recalls helping carry the counter over from the corner of St. Urbain and Fairmount as a child. The Richlers’ country house is about an hour and a half from the city, in Quebec’s Eastern Townships. Moviegoers who have seen Duddy Kravitz might confuse the Townships with the beautiful resort area that had the lake Richard Dreyfuss (as Kravitz) coveted so fiercely. But that was in the Laurentian Mountains, northwest of Montreal, near Ste.-Agathe-des-Monts. The Townships, which guidebooks say are perhaps Quebec’s best-kept secret, compose another resort area east of the city and abutting the U.S. border. This was where James Woods, as the famous writer Joshua Shapiro, rode out his wife’s nervous breakdown and his many other troubles in the film version of Joshua Then and Now. And where Moses Berger, Richler’s latest hero (of sorts), lives in a cabin and goes about his grim obsession: writing a biography of the maddeningly elusive yet seemingly omnipresent Solomon Gursky, middle of three founding brothers of the fictional Gursky liquor dynasty. The Richlers’ country place is atop a hill overlooking Lake Memphremagog, near the Vermont border. There are big picture windows along much of the house, including the snooker room Richler built himself since buying the place 12 years ago. Richler introduces me to his wife, Florence, who is beginning to prepare dinner and listening to opera on the radio. He tells her he’s taking me for a quick drink, then tosses a cardigan on over his work shirt and corduroys, pulls on a pair of hiking boots, grabs a cardboard boxful of garbage that Florence has asked him to take out, and we’re off, Richler leading the way in his seven-year-old Volvo. If Canada had a soul (a doubtful proposition, Moses thought), then it wasn’t to be found in Batoche or the Plains of Abraham or Fort Walsh or Charlottetown or Parliament Hill, but in The Caboose and thousands of bars like it that knit the country together from Peggy’s Cove, Nova Scotia, to the far side of Vancouver Island. One of the men who frequented The Caboose ran a gravel pit, another owned a dairy farm, others picked up carpentry jobs here and there, and still more worked as caretakers or handymen for the rich cottagers on the lake. For most of them it was a matter of stitching together twenty weeks of summer work in order to qualify for unemployment insurance in the winter. Failing that, they went on welfare, bolstering their take on the barter system. If Sneaker painted Gord’s barn he came away with a side of beef. If Legion Hall retiled Mike’s roof he could have the hay from the field across the road and sell it in Vermont for $2.50 a bundle. The men owned their own cottages, cut their own winter wood, and counted on shooting a deer in November. The real-life Caboose is Richler’s safety valve, his means of staving off cabin fever. His daily routine since moving to the country full time three and a half years ago has run something like this: write for three hours, beginning at 8:30; drive to the store for his newspaper and read over lunch; edit the morning’s output until 3; stop for a coffee break with Florence. Four o’clock and he has barely set foot out of the house. So he goes off to the bar for a little socializing before dinner. He cuts an oddly professorial figure here in his cardigan and glasses; even so, Richler fits right in, on an easy first-name basis with the locals. A grinning farmer, missing his upper front teeth, tells Richler his hair is getting too long. When the farmer’s wife mentions she’s been reading Gursky before going to sleep at night, some joker gets a laugh by asking the farmer what he thinks about his wife “going to bed with Mordecai.” A retired Montreal businessman grouses about tourists who speed along the icy roads toward area ski resorts, suggesting that when the fools run their cars into ditches the locals should leave them there. Across the room, rough-looking tattooed teenagers play a quiet game of pool, one of them from a wheelchair. At one point, Richler leans back, smiles, shakes his head and flashes that squint of his. “That party I was at last night?” he says, casting a bemused look around the room. “Pierre Trudeau was there.” He shakes his head again and laughs, a man at home in two absurdly different worlds. After sitting awhile, Richler gets fidgety and heads toward a row of a half-dozen or so arcade poker games that line one wall. Each has paper fastened above it on which the name of a patron is scrawled in huge letters. In smaller print, on the machines themselves, are warnings that the games are not to be used for gambling. The sign above the machine on the far right reads: MORDECAI. Richler parks himself in front of it and remains there the rest of the afternoon, a housepainter named Roger looking on. Roger, an affable man with a crew cut (and, like the farmer, missing his upper front teeth), is dressed something like SCTV’s MacKenzie brothers: plaid shirt, plaid jacket, knit Molson’s gimme hat. He says he used to play the poker game, too, but during a run of particularly bad luck some time earlier, he’s lost more than $200 in a single night, causing him to swear off it. Now he just watches, and he and Richler are having a ball watching Richler run up a big score. Pump-pump-pump-pump-thwapp — Richler slapping the controls that put the cards in motion. Discard, discard, discard. Two pair, kings and sevens. Pump-pump-pump-pump-thwapp. Pause. Discard ... discard. Hand after hand, the game goes on, the three of us watching intently. Richler catches my eye and squints once more. How utterly preposterous: A 59-year-old man — one of his country’s leading men of letters, no less — absurdly slapping away at a silly arcade game. The score moves up, down, up, down again. The retired businessman sends over a fresh round of drinks. 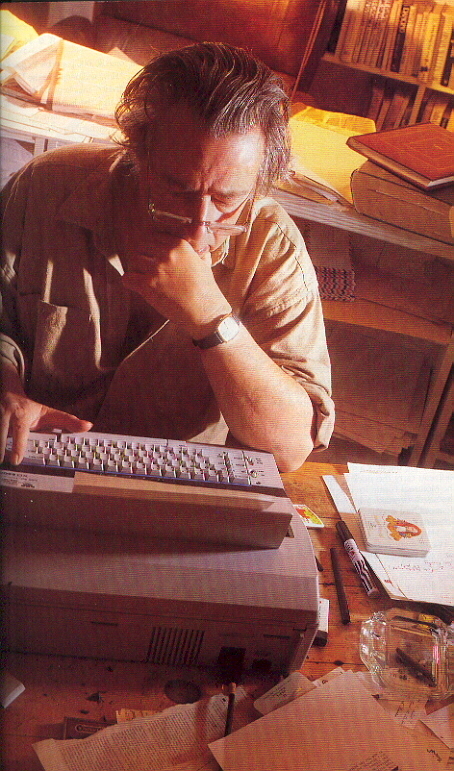 Richler checks his watch. Time enough for a couple of quick hands, but then he’d better be going. He’ll quit when the score hits 320, he says. When it does, Richler finally, reluctantly, calls it quits. He leaves half of his last scotch-and-water on top of the game and makes for the door, pausing on his way out to pick up his winnings. Forty dollars. Could have been more, maybe, if he’d had more time, but Florence would have dinner ready soon. 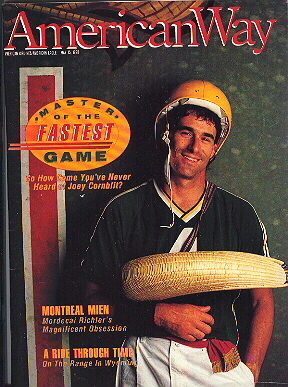 Then the Montreal street kid turned country gentleman steps outside, climbs into his funky old hatchback, and drives back up the icy road toward home. Bill Beuttler is an American Way contributing editor.